The Horton Ho.2 was of the same general layout as the H I but with sweepback increased from 19 degrees to 26 degrees and the lateral and longitudinal control combined in an elevon. Inboard flaps extending from elevon to center section were used to increase maximum lift and drag for landing. The first version was completed as a glider and the second fitted with a 60kW / 80 hp Hirth engine driving a pusher propeller in 1935. 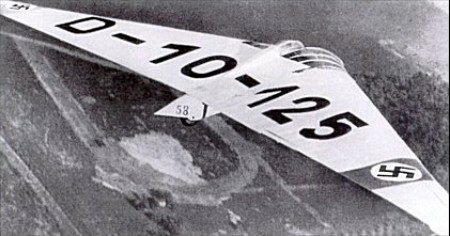 In this aircraft the pilot was seated in a reclining position and completely contained in the wing contour; a maximum level speed of 210 kph was achieved. 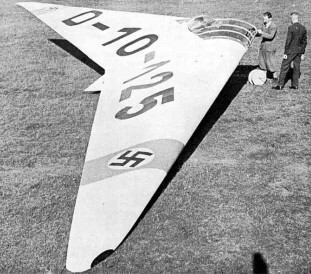 This was tested in 1938 by Hanna Reitsch and attracted the attention of Ernst Udet, Director of the Technical Department of the German Air Ministry, who made funds available for further development. Subsequently there more gliders were built, the last being completed in 1937 after which the type was abandoned in favor of the H III. The root wing section was change from the 20% symmetrical H I type, to a 20% section with reflexed camberline (zero Cmo) changing along the span to a symmetrical tip section. A balance tab was fitted to lighten the controls which were all pushrod operated. 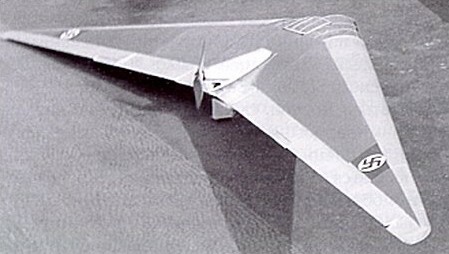 The structure was in three parts, as in all subsequent Horten designs. The center section being the welded tube and the outer panels of wood with a D-nose spar. The wheel undercarriage had brakes and the front wheel was retractable. Drag rudders consisted of lending edge flaps (as on the Horten III) opening against a spring. From a translation of Hanna Reitsch’s report on one of the H II gliders, it is clear that lateral and directional control were still only partially satisfactory although characteristics at the stall were excellent. This feature is remarkable, for although a wing twist of 8 degrees was used the effect of the high taper and sweepback might be expected to overpower the beneficial effect of twist in delaying the tip stall.